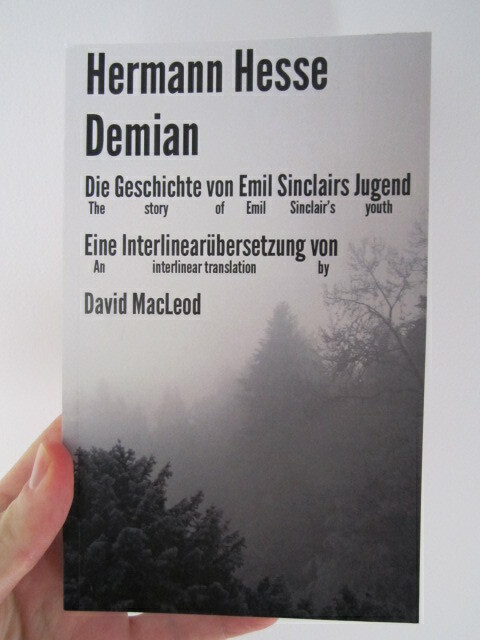 Yesterday I wrote an announcement in German that I translated a book (because the book is in German), and now the same subject in English. 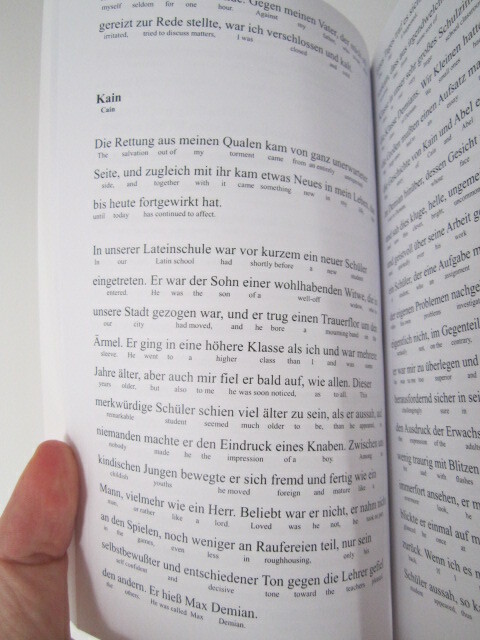 The title of the book answers why I've made a translation of a book that has been translated into English and other languages so many times: this is an interlinear translation, one that includes the original German but has the English translation just below in smaller font. But the word Egel does not mean angel (angel = Engel); Egel means leech. Such an error is easy to slip unnoticed in an English translation with no hint of the original, but in an interlinear translation accuracy is much easier to achieve. Not that my translation is guaranteed to be error-free, mind you (though Olivier Simon did have a read through it and sent some corrections), but any that exist are that much easier to spot. - Those who simply like seeing the original, and reading a translation that feels more like it. Und das war seht gut. "No, I know not. I believe, to the miller." Ja, was soll ich dir noch sagen? Yes, what shall I to you still say? But some have no choice but to be rearranged a bit. vor denen auch die Mutter mich nicht schützen konnte as "from which even Mother me not protect could"...is too awkward to be readable. There are also words from time to time that simply shouldn't be translated: technically it is possible to translate these small words, but always finding an English equivalent for every wohl and doch and etwa and ja and so on simply isn't desirable. The first part of some split verbs was also often omitted when it came at the end: in a sentence like "Er sah blab blah blah blah (very long sentence).............an", by the time you get to the end of the sentence the original verb attached to the an has been forgotten, and there is often no good English equivalent anyway. In the middle of these are sentences that could be translated word for word, but somehow just felt better with a slight modification. Sentences with the verb before the pronoun were often the case here: "Noch heute, glaube ich" just felt better as "even today, I believe" (with "I believe" spaced under "glaube ich") than "even today, believe I". 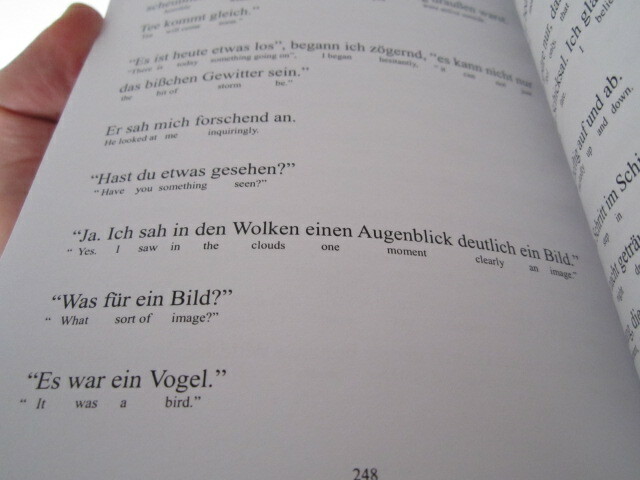 Whenever in doubt I went for readability as long as the alteration of word order was not too severe. "Wenn ein Tier oder Mensch seine ganze Aufmerksamkeit und seinen ganzen Willen auf eine bestimmte Sache richtet, dann erreicht er sie auch. Das ist alles." "When an animal or man his entire attention and his entire will on a certain thing fixes, then he attains it too. That is all." 2) What about publishing? Well, this book at the moment is printed, but not published per se. I have ten copies of it in paper. Hermann Hesse died 49 years and 7 months ago, and apparently copyright expires 50 years after the death of an author so I could publish and sell it on lulu.com or some other place starting in August. 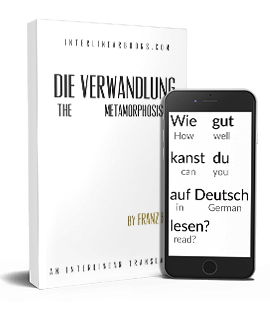 Ideally though, I would like to publish it through a German publishing firm, not only for the extra exposure it would get but also for the extra promotion interlinear translations may get, a medium that I believe to be vastly underrated for learning languages at the moment. An interlinear translation is a book in another language that one does not need a dictionary to read, while still being able to read the work in the original language. 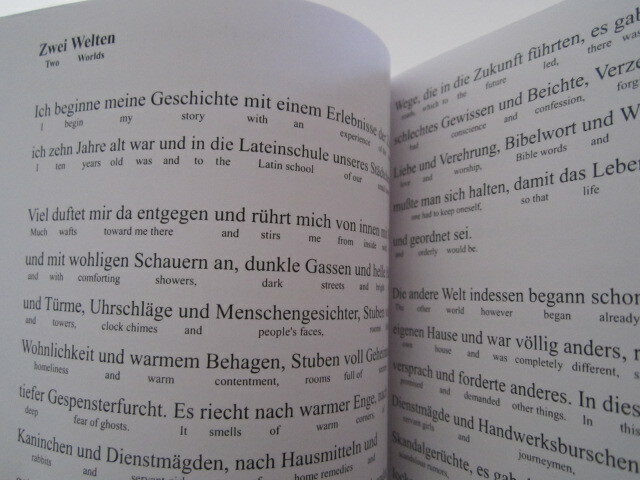 Depending on the type of translation it could also vary: from the one I have chosen with a minimum of readability in English, to a heavily marked-up version geared especially for the student, with things like different colours to indicate the gender and marks to show the case, a glossary at the back, and so on. And so I will end this post the same way I ended yesterday's German one: send me an email if you work at a German publishing firm. While I did the translation for 99% (okay, 100%) personal reasons, I feel obliged to do whatever can be done to keep it from simply sitting here, undiscovered.